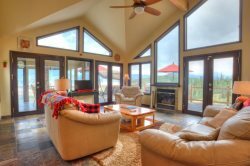 All properties found below are either within walking distance of town or the resort or have complimentary transportation to get you everywhere you need to go in Summit County on your next trip. Unbeatable convenience! These properties are also within walking distance to great dining and shopping options as well as the FREE bus - The Summit Stage, that can take you anywhere in the county including ski resorts! Book one of the convenient rentals today! 3 Bedroom 2.5 bath Frisco!